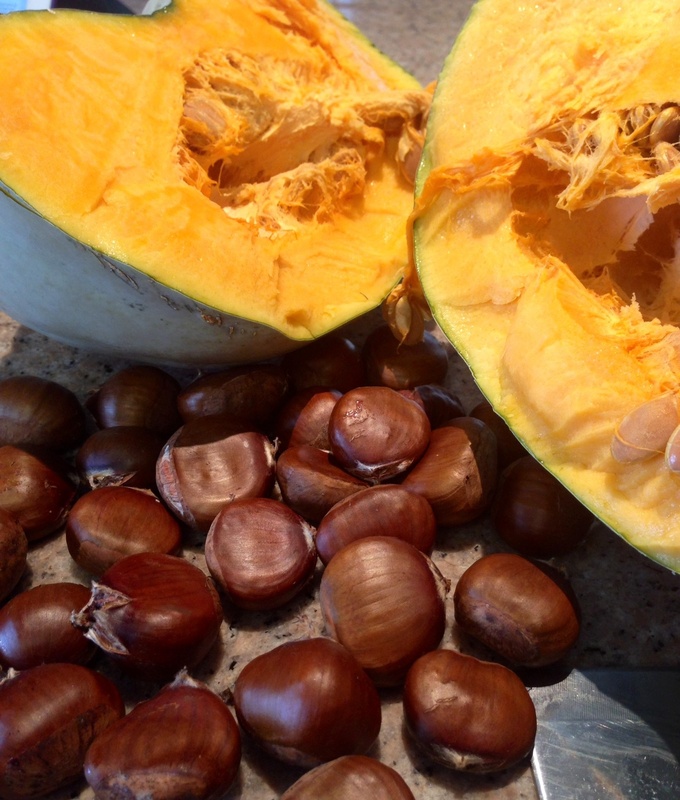 I saw this recipe in the Canberra section of Goodfood.com.au and knowing that I had a big Queensland Blue in the cupboard from the Collector pumpkin festival, and excited about embarking on a hunt for local chestnuts, this was a recipe high on my list of things to cook this weekend. I love that I have sage and rosemary growing in my garden, and the great Sunday morning shop at the Southside Farmers Market yielded me such fantastic locally produced and grown fruit and veg, I was on a food high. 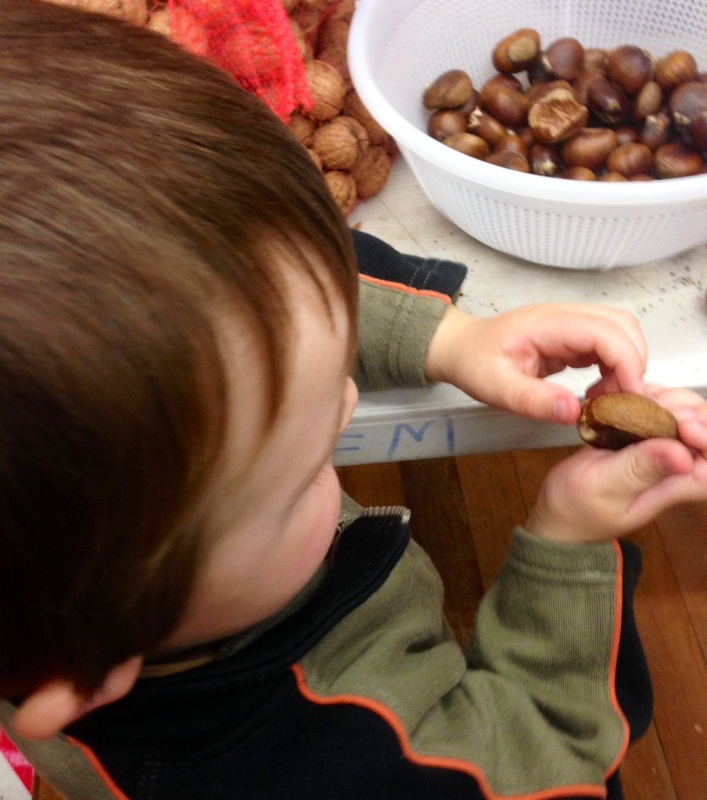 Buddy loves Orange Soup, and volunteered to help me choose the chestnuts, and then cook our soup. 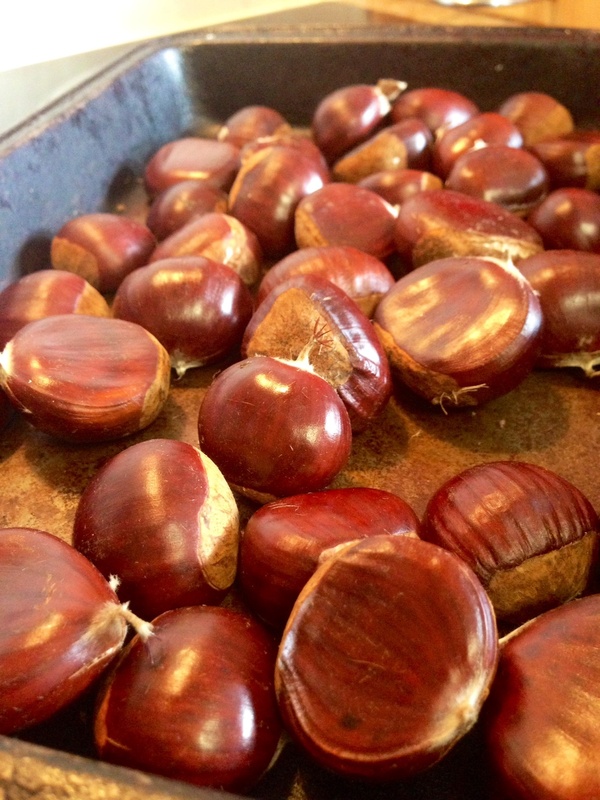 How gorgeous do these chestnuts look, about to go into the oven for roasting. Make a slit in the pointy end and roast for about 30 minutes @ 200. You should notice the skin splitting which is an indicator they’re ready to be removed and cooled. Don’t worry if a number of them don’t peel whole, they are going to be blitzed in the soup anyway. 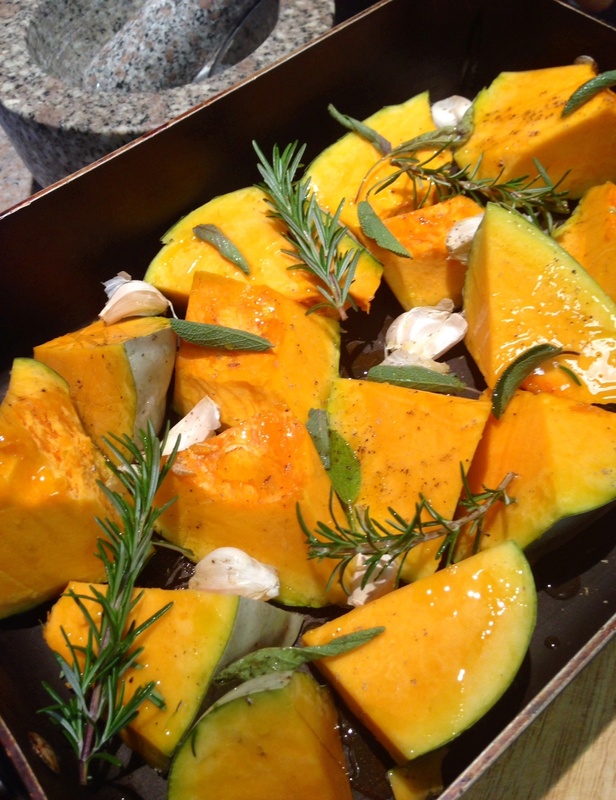 Chop the pumpkin and add to a roasting pan, with the separated garlic cloves, rosemary and most of the sage, extra virgin olive oil and seasoning. Leave a few sage leaves for the final dish. 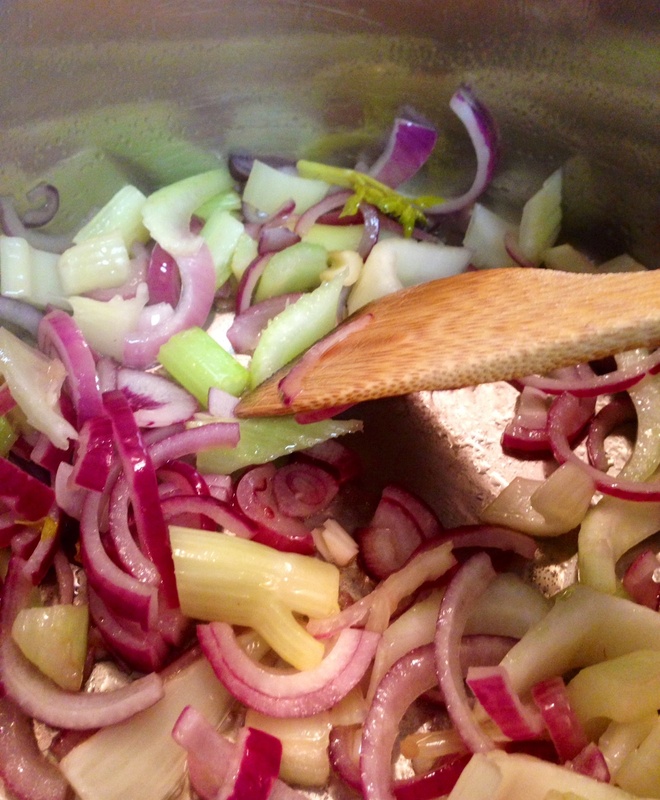 Add the chopped onion and celery to a pot and sauté until soft. 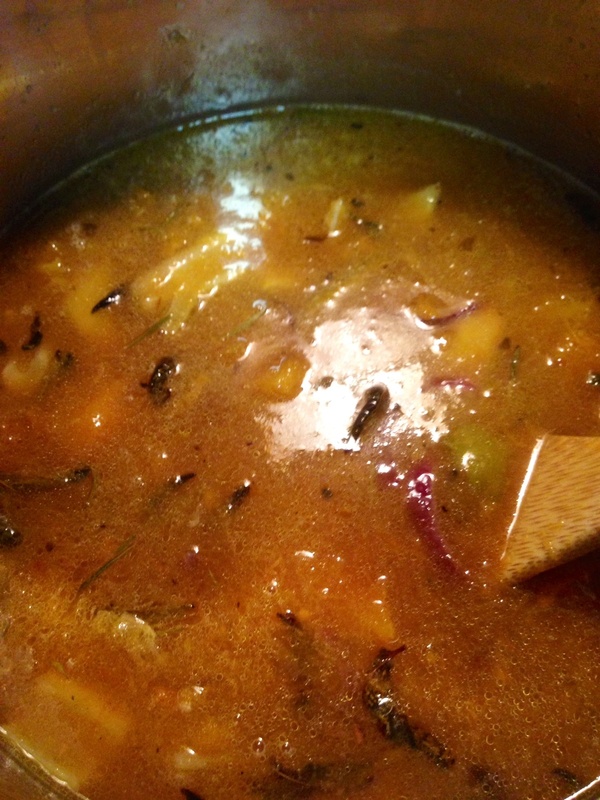 This is the base of the soup. 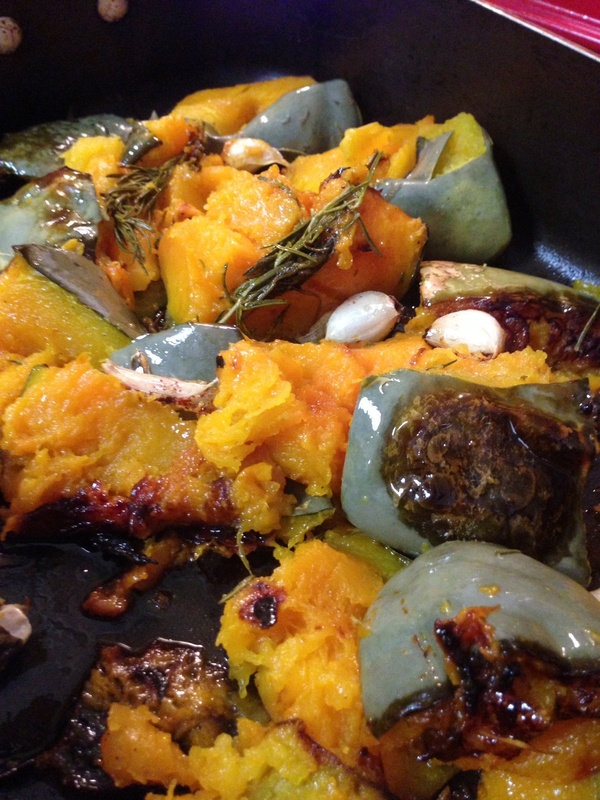 Roast the pumpkin until soft and caramelised in parts. The best part about this, is that as a cooks treat, you can peel the cooled garlic that’s all squishy and caramel and chew on the skins, like yummy garlicky chewy. Get rid of the rosemary sprigs at this point. At this stage I removed as much of the flesh from the skins, chucked the skins out and poured a couple of cups of stock into the roasting pan to aid in the scraping of all the flavoursome bits off the bottom. It all went into the pot with the stock. Bring to the boil and then simmer for 30 minutes, then blitz until smooth, season if necessary. This step isn’t imperative, but I like frying bits and pieces and adding them to soup to give it some interesting texture. 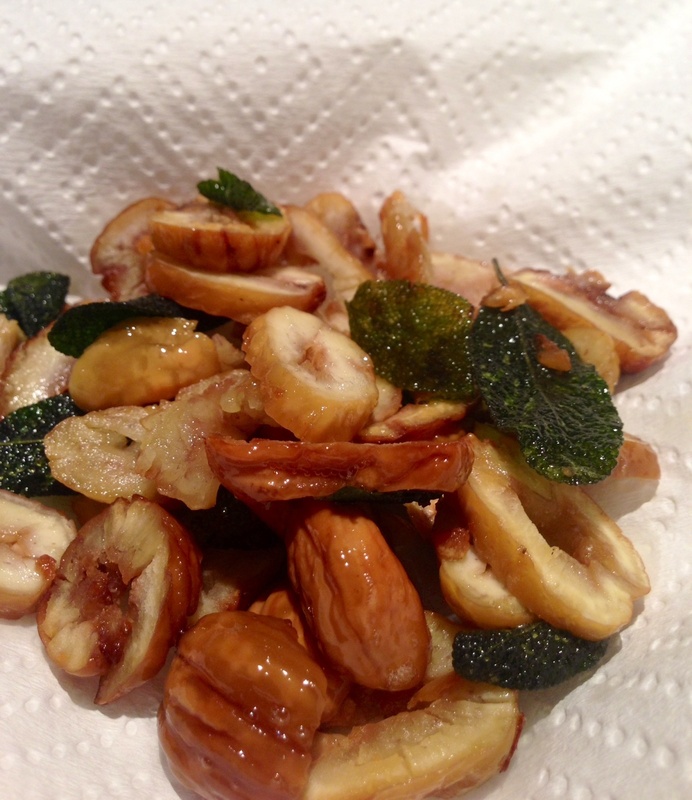 Chop up the remaining chestnuts and fry in a pan with whole sage leaves until all is crispy and crunchy. Add some cream to your bowls and top with the crunchy bits. Served with big slices of olive and pesto sourdough, also from the markets. 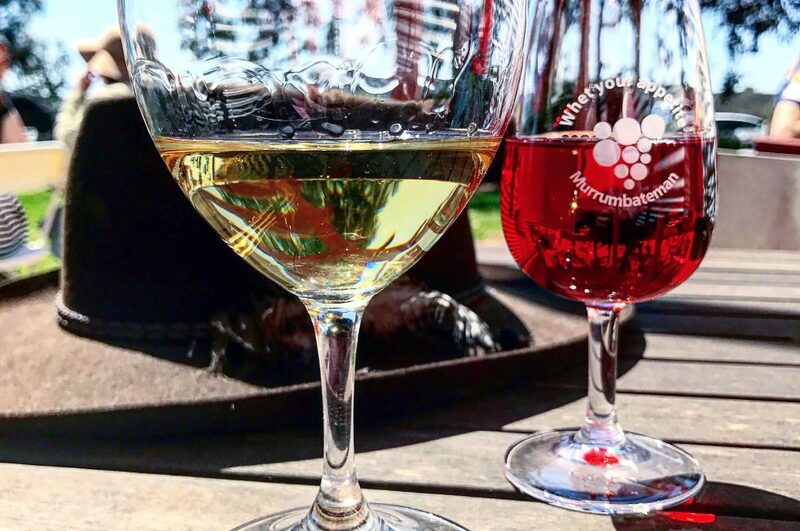 What do you love finding at local markets? Wow, Fran, this looks and sounds really really good! Fran! 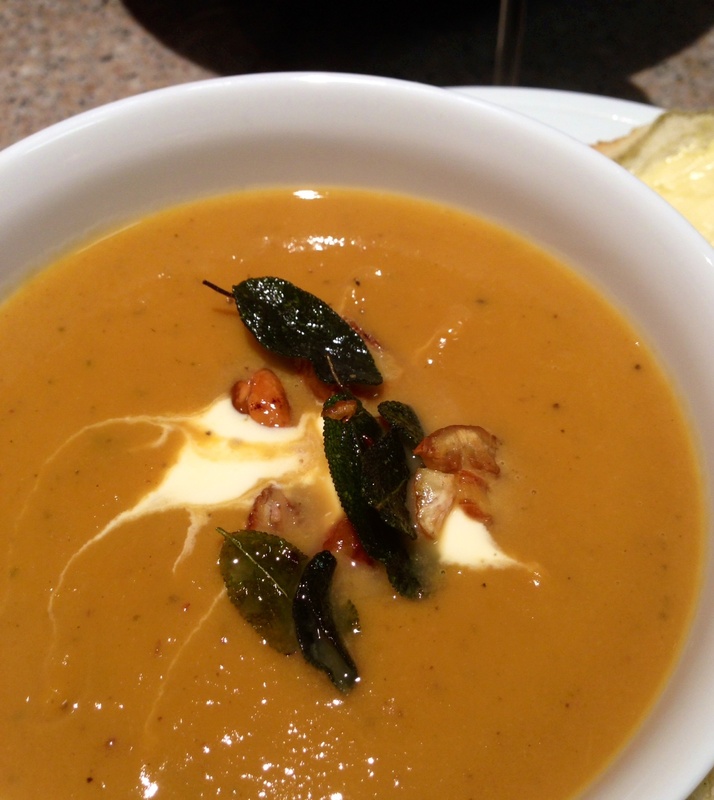 I love chestnuts in soup, and I love sage with pumpkin, and I love your seasonality. 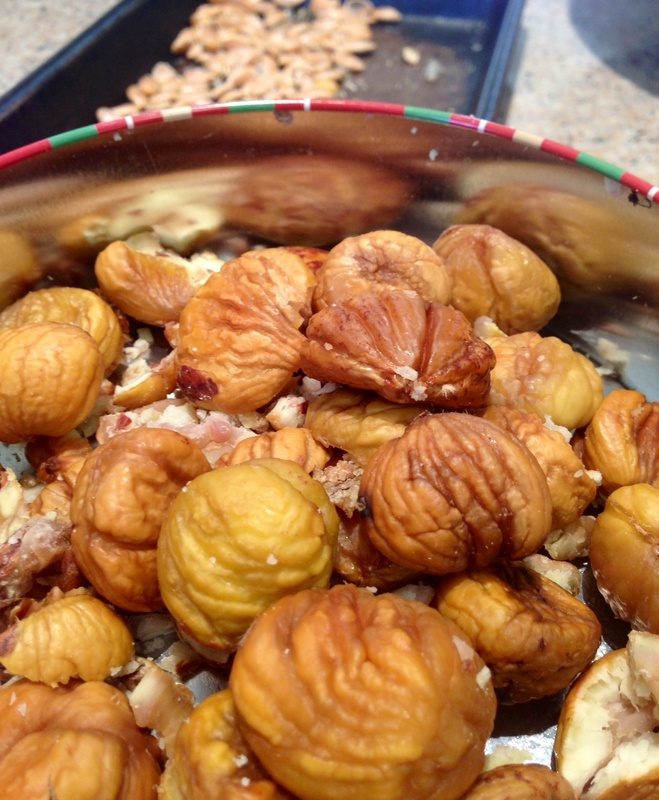 This is a great post and a great recipe. Thank you. You’re welcome 😄 It was pretty simple, and very tasty but apparently my pregnant work colleague thought it was garlic overload! But, then, her senses are heightened, lol. Nice post Fran. Looks delicious! we will definitely be trying this recipe. Great recipe, will defo be having a crack at this. 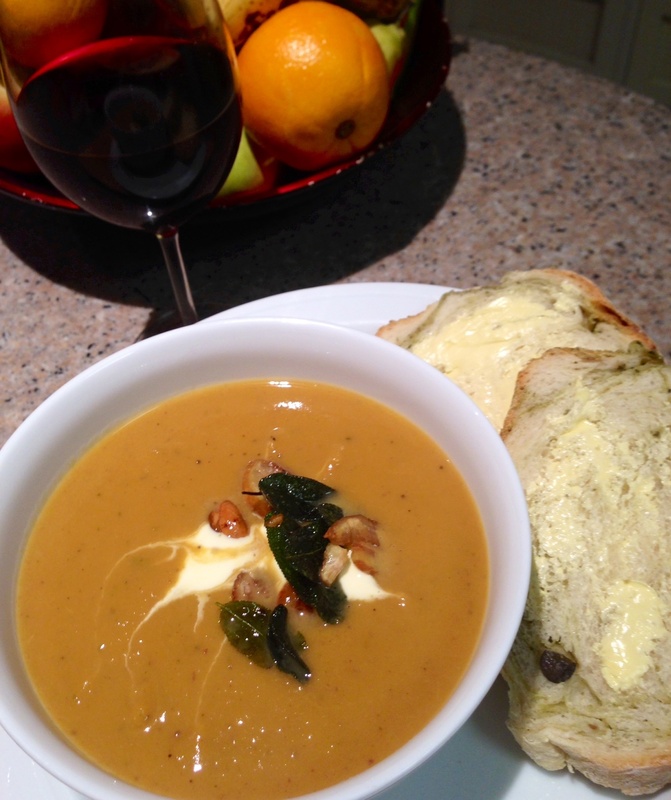 Love mixing up what I add to my pumpkin soup, last winter it was pumpkin & ginger.